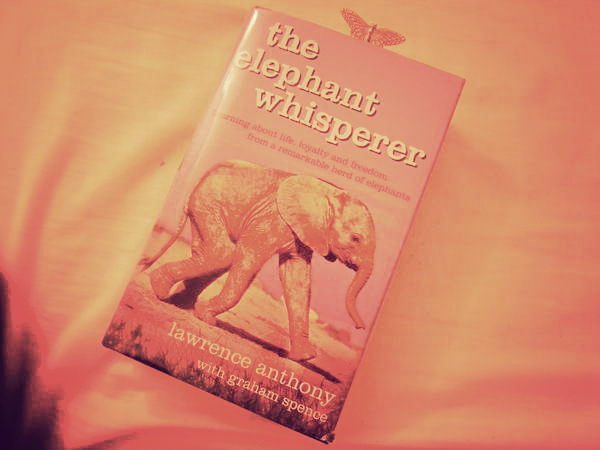 I started reading a book called The Elephant Whisperer last night. A cornyish title, I know, but nonetheless an absolute page turner chronicling the gruelling process of relocating a rogue herd of very angry elephant from a game farm in Mpumalanga to a reserve called Thula Thula in KwaZulu-Natal. Penned by Lawrence Anthony, owner of Thula Thula and man of the bush through and through, this fascinating real life account not only gives one great insight into the unbelievable collective consciousness of a herd of pachyderms, but also leaves one longing for the simplicity and vibrancy that is the African bush. Either way, certain lyrical passages had my heart aching, my eyes tearing and my senses yearning. Yearning for those long ago days when my oupa still had a little house – one he built himself, by the way – called Brokkie Son on the southern bank of the Crocodile River and the not-so-long-ago-days when my parents, brother and I would take fun-filled family trips to the Kruger Park… which, ironically, were never considered quite complete without AT LEAST one mock charge by a highly vexed elephant mom to round things off with. Despite these knee numbing, nerve wracking incidents, my memories of the bushveld are nothing less than blissful: Waking up to early morning bird chatter, steaming coffee and home-made rusks, gas cooker brunches under acacias with curious monkeys, hornbills, starlings and even the odd bushbuck wanting to partake. 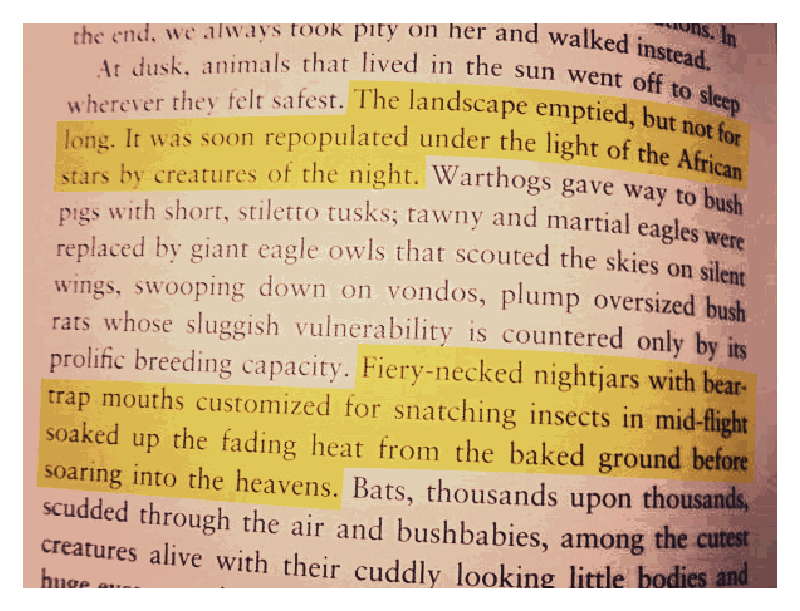 Pre-dawn game drives with their special atmosphere of crackling expectancy. Coaxing ant lions from their sand pit lairs with fine blades of grass or fragile sticklings, while softly chanting “gogo, gogo nigamanzi. Gogo, gogo, nigamanzi (Old woman, old woman, give me some water)” Zulu speakers, please forgive my spelling. The downside? 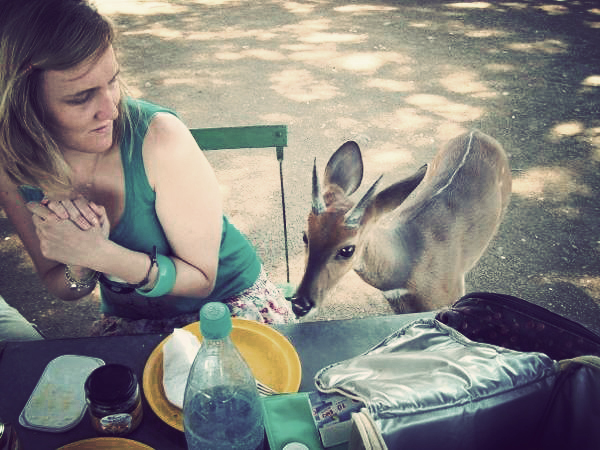 Bushbuck interfering with brunch. Late night braais, and the beat-beat-beating of my heart during those record time sprints from Brokkie Son’s front door to the lapa on the other side, not knowing which sets of glowing eyes may be hiding in the rustling grasses, following my every move… Only to have many-a dawn reveal tracks of kudu, zebra, warthog and giraffe, mingled with the padded presence of jackal, or lion or even hyena in the fine red dust. Yes, I may have grown up by the rumbling ocean, and now revel in the constant pulse of urban life, but somehow the dust and the thorn trees of God’s good earth and the endless stars and hyena whoops and African night jar laments directed at the hovering moon seem to have gotten me first. 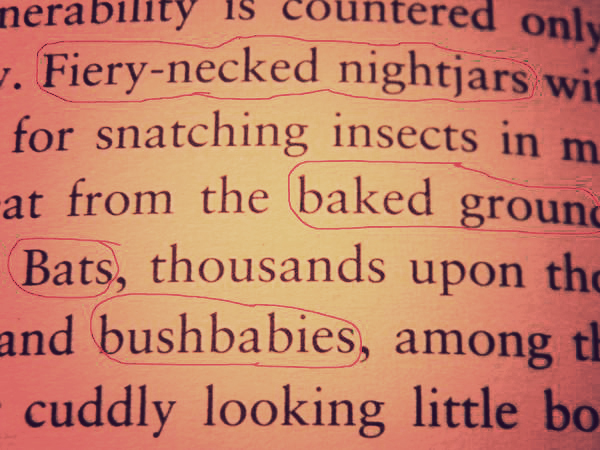 I think they stole my heart with their promise of constant connection to the most tangible of elements: the bushveld earth. 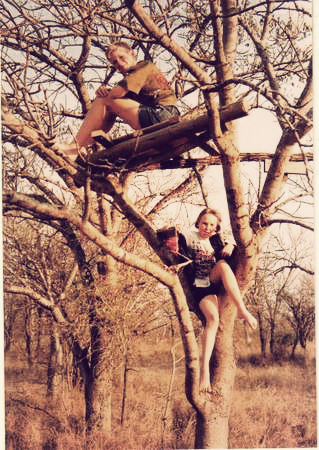 My brother and I in the Marloth tree house we built with our cousins. And now, losing – or maybe rather finding – myself in the pages of this book I am awakened once more to the lure of my almost forgotten love affair, making me fairly certain of the fact that my life would be a half-lived thing if I didn’t give in to the urge of an extended stay – perhaps six months, a year, maybe two. this was SO incredibly beautiful!! it made me miss home, more than usual! Aah, Nadia!!! Nou wil ek op ‘n bosvakansie in die wildtuin wees en dis alles jou skuld. Ek dink ek moet ‘n roadtrip deur Afrika vat – of at least net plekke soos Botswane en Namibië en dan maar weer terug Kruger toe. Maak jy my nou min lus vir werk!! made me nostalgic for bush trips too- my family would pile into a kombi most july holidays, all seven of us! living in pretoria did recreate some of the connection you were talking about, that feeling of being removed from something, even though i don’t know what that something is. i also need to get back to the bush. and i absolutely loved the elephant whisperer too. so moving. i think also because i am obsessed with elephants! Stumbled across your blog entry about the Elephant Whisperer just now and your words made me so homesick! You write beautifully — thanks for sharing! I can also identify with those feelings and that love affair. I grew up between the Drakensberg and Kruger and spent many a weekend there. Half a world away in the US, not a day goes by when something triggers a memory of life over there and our family’s visits to Kruger.